Ever wanted to have Ken Block's Gymkhana-tested Ford Fiesta Monster Rally car? Yeah, us too. But you can't have it. So here's the next best thing — an opportunity to win one of three just-released-today Ken Block Fiesta Hot Wheels cars — including one you won't be able to buy today... because they already sold out! There's three different cars — three 1:16th RC cars, three nitro speeders, and three die-cast Fiestas (pictured above). The RC cars and nitro speeders are fun because they're interactive. The die-cast car is awesome because it's rare like steak. So we'll choose the nine winners by randomly selecting them from the commenters on the "Comment here for a chance to win a Ken Block Ford Fiesta" thread on our official Jalopnik Facebook fan page. 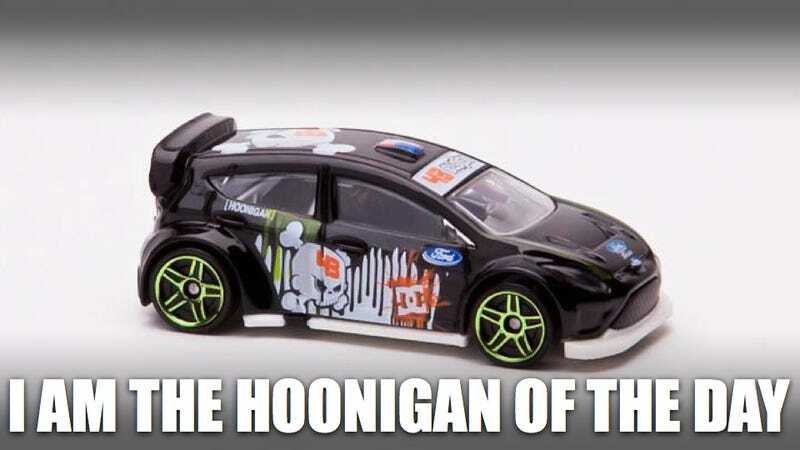 All you have to do is head over and join our official Facebook page and drop a comment saying which car you want (choose either RC car, nitro speeder car, or die-cast car) on the "Comment here for a chance to win a Ken Block Ford Fiesta" thread. Your comment serves as your entry into a random drawing for the model. All you have to do is join and comment. We'll randomly pick one winner tonight at 9:00 PM EST.